Refurbished C Stock at Barbican. The stock was finished in the corporate red, white and blue. The paint was a two-pack graffiti resistant paint which has demonstrated over the years that it only works if it has been properly kept clean and the right chemicals are applied to remove the graffiti. The difference between this stock and the still-pristine A Stock finish can only be due to a lack of attention being paid to the maintenance of C Stock compared with the Metropolitan's A Stock. 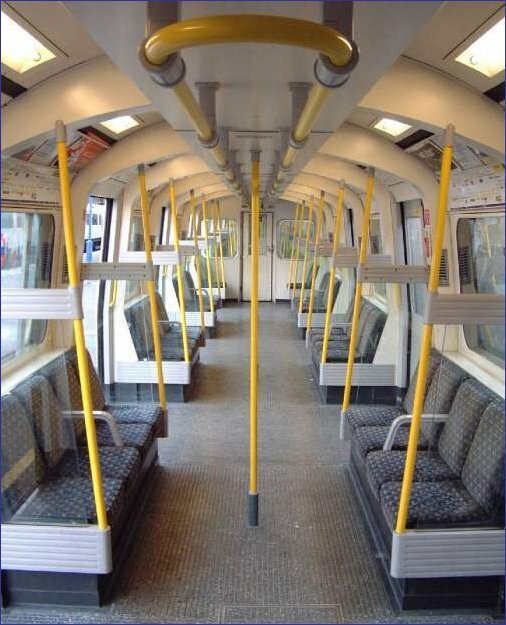 Interior of a C Stock car as refurbished. The original interior has been completely stripped and re-equipped in a more modern style. This is probably the best refurbishment design of the London Underground. Compare this with the original C Stock interior. The main features are the end windows, added to increase the passengers perception of security by allowing them to see into the next car, and the all longitudinal seating. This creates a wider gangway, helping capacity and improving the interior view. The ceiling mounted grab rails are also useful. Photo by District Dave.